Irene at Sundance organised this villa for us in an emergency. 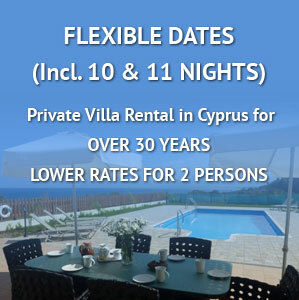 Within a few hours we were very happily settled in this comfortable, lovely, spacious villa. It was immaculately clean with so much space inside and outside. The villa is very well cared for and maintained. The owner visited the following day to check everything was ok and see if we needed help with anything. The next day we had a problem with the light in one of the bathrooms. We contacted the owner she was unable to fix so an electrician was brought in ( Saturday night! ) and the problem resolved within an hour or two. We had thought being so close to the strip it would be noisy. Far from it. We had great peace and being round the corner from all the eateries and entertainment was such a bonus. We loved it and really enjoyed the many walks from the villa. Being so close to all the amenities was just brilliant. If we could only have a one week stay in Cyprus this would be our first choice. Thank you to the owners and your support team and a big thank you to Irene. Our favourite Coral Bay villa now, and the fact that you offer 2 person rates is excellent. The pool at Villa Jardim was one of the best kept pools we have ever used in Cyprus!